Join us at Flandrau Science Center & Planetarium to find out what $1,000,000 of upgrades, including digital projection, in the Eos Planetarium sounds and looks like. It’s an amazing way to see the stars, Milky Way, and other distant galaxies! 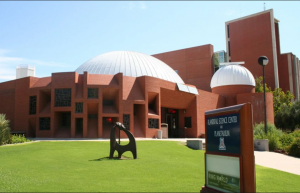 You’ll also learn about the UA Science outreach centers and programs that bring scientific discovery to the public through interactive education, lectures, and tours. Outreach centers and programs include Flandrau, Richard F. Caris Mirror Lab, Biosphere 2, Mt. Lemmon SkyCenter, Geotourism, Science Cafés, and soon the UA Allan Norville Gem and Mineral Museum at the Pima County Courthouse! The University of Arizona College of Science brings together globally prominent faculty in disciplines at the core of scientific inquiry and education. The college’s academic departments, schools and research units encompass physical, mathematical, environmental, cognitive and life sciences. With over 7,500 undergraduate and graduate students, UA Science is an integrative learning institution, where accomplished faculty and next-generation scientists engage side-by-side in groundbreaking research. The college’s scientists and students also share their knowledge with the local and broader community through extensive outreach and public service initiatives. Our mission is to encourage the aggressive pursuit of research excellence, to support novel teaching and outreach programs and to create economic opportunities for our community. Parking Map – Surface parking is free after 5pm. Parking garages will be $1 per hour after 5pm. Join Optics Valley, Strategy1, and the Optics & Photonics community to celebrate the International Day of Light on May 16th at 5:30pm at Aloft Tucson University. Click HERE for more details.